Below is a list of the tiaras worn by the women of the Monegasque princely family; it includes only the tiaras currently worn by the family, not historical tiaras or tiaras whose ownership is currently uncertain. Click on the title of the tiara to be taken to pages with fuller histories, large images, and much more information. Enjoy! The Bains de Mer Tiara: A trio of diamond and ruby elements, able to be removed and worn separately as brooches, set atop a thin diamond band. Made by Cartier ca. 1956. Presented to Princess Grace as a wedding gift by the Société des Bains de Mer. Worn by Princess Grace. The Baumer Aigrette: An all-diamond aigrette designed to resemble the spray rising off a cresting wave. Made by Lorenz Baumer in 2011. Commissioned by Prince Albert II as a wedding gift for Princess Charlene. Worn by Princess Charlene. The Cartier Pearl Drop Tiara: A diamond, gold, and platinum tiara, featuring large pearl drops suspended from elaborate arches. Ordered from Cartier by Princess Charlotte in 1949. Worn by Princess Charlotte and Princess Caroline. 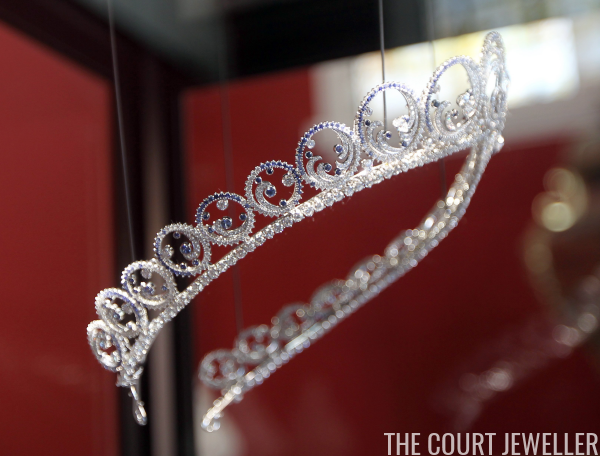 The Century Ball Tiara: A grand diamond tiara with a v-shaped base. Purchased by Van Cleef and Arpels after World War II. Loaned to Princess Grace for the Century Ball by the firm in 1966. Often (incorrectly) said to have belonged to Empress Josephine. The Ocean Tiara: A tiara of circles set with diamonds and sapphires, including design elements that resemble cresting waves, convertible for wear as a necklace and accompanied by a coordinating pair of earrings. Made by Van Cleef and Arpels in 2011. Commissioned by Prince Albert II as a wedding gift for Princess Charlene. Worn by Princess Charlene. 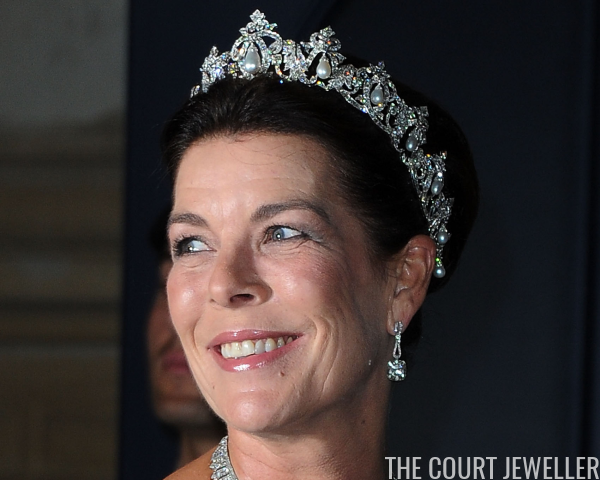 Princess Caroline's Sapphire Necklace Tiara: A necklace of square diamond and sapphire clusters, set on a frame for wear as a tiara. Worn by Princess Caroline. Princess Charlotte's Fringe Tiara: A classic diamond fringe tiara, or tiara russe, able to be worn low across the forehead. From the collection of Princess Charlotte. Similar to a necklace now worn by Princess Caroline, but the two pieces are not the same. Worn by Princess Charlotte. Princess Grace's Diamond Festoon Tiara: A platinum and diamond tiara in a festoon design. From the collection of Princess Grace. Worn by Princess Grace and Princess Caroline. Princess Grace's Diamond Necklace Tiara: A tiara consisting of a trio of elaborate diamond festoons, convertible for wear as a necklace. Perhaps created by Van Cleef and Arpels. Worn by Princess Grace. 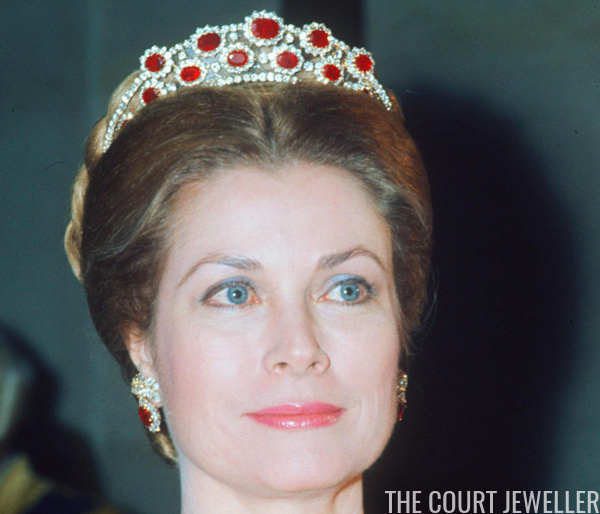 Princess Grace's Mystery Tiara: A diamond tiara, depicted in a painting of Princess Grace. Possibly an artistic invention. 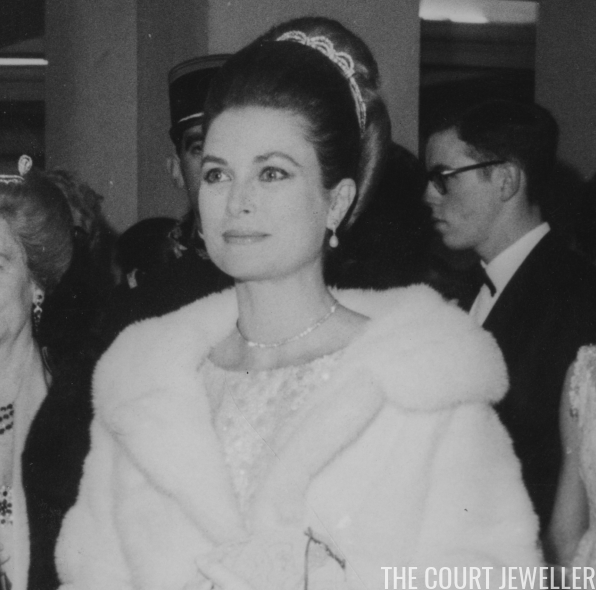 Princess Grace's Turquoise Tiara: A towering ornament, likely set with turquoises and diamonds. Worn by Princess Grace on National Day in 1980. Tatiana Casiraghi's Diamond Fringe Tiara: A classic diamond fringe tiara. Worn by Tatiana Casiraghi. Worn as a wedding tiara by Tatiana Casiraghi (2014). The Van Cleef and Arpels Diamond Tiara: A tiara of platinum set with round, marquise and pear-shaped diamonds, convertible for wear as a necklace. Made by Van Cleef and Arpels and loaned to Princess Grace. Worn by Princess Grace at Princess Caroline's pre-wedding ball in 1978. The Van Cleef and Arpels Ruby Tiara: A kokoshnik set with ruby and diamond clusters. Likely made by Van Cleef and Arpels and likely loaned by the firm. Worn by Princess Grace for a gala at Versailles in 1973.